I'm calling this last installment of my Top 20 the Special Effects Division. It's anything that didn't fit into the first four, and there are some special things here. 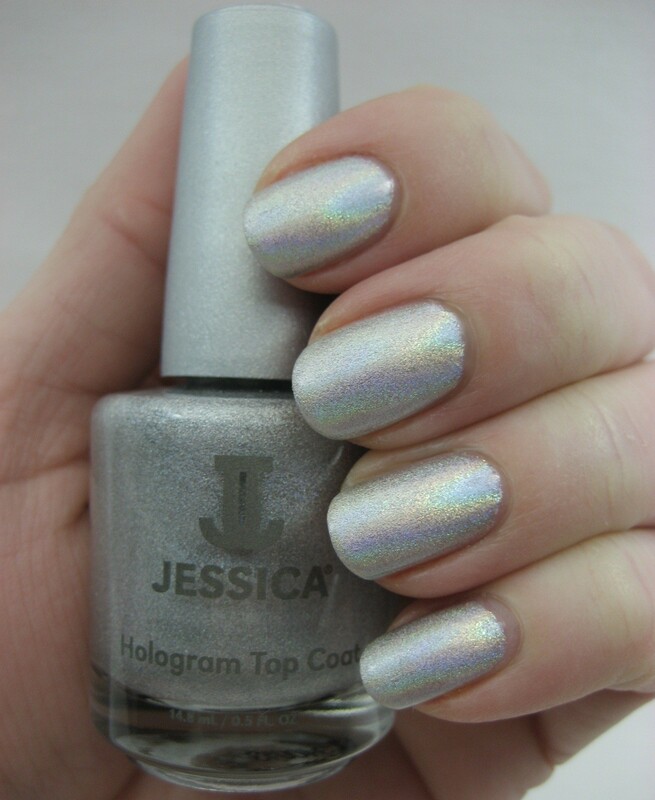 Jessica Disco Diva had to be on this list somewhere, and here it is. 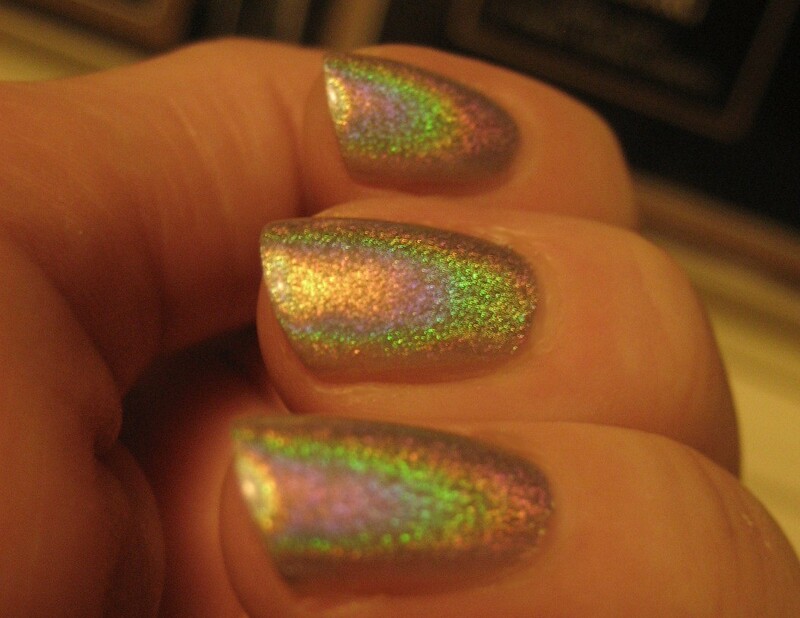 It bumped GOSH Holographic off the list because it's just a bit more holo-y. Yeah, they're pricey, but they deliver on the promises on the box, and there's always sales and CVS Extra Bucks to get them a bit cheaper. So there you have it, my Top 20 for 2011. I can't wait to see what 2012 has in store. 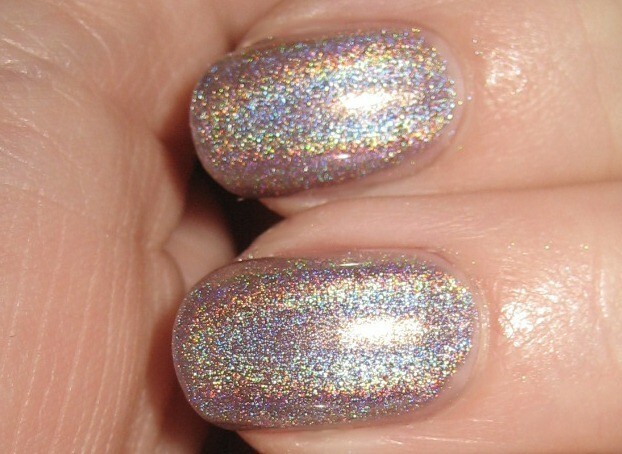 More holos, I hope! 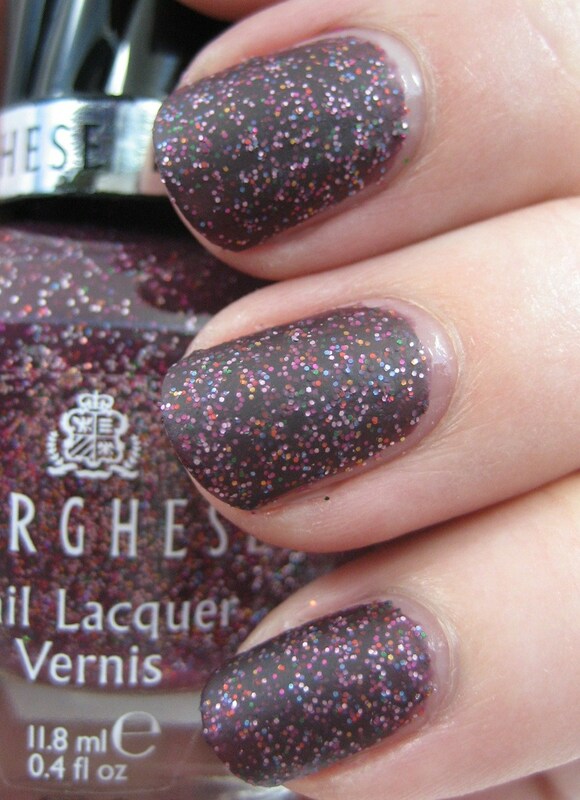 What are your nail polish wishes for the new year? Oh, the Glitter Division. How I struggled to choose just a handful of polishes for this group. I ended up keeping three from last year: Borghese Purple Confetti, OPI Mad as a Hatter, and Deborah Lippmann Across the Universe. 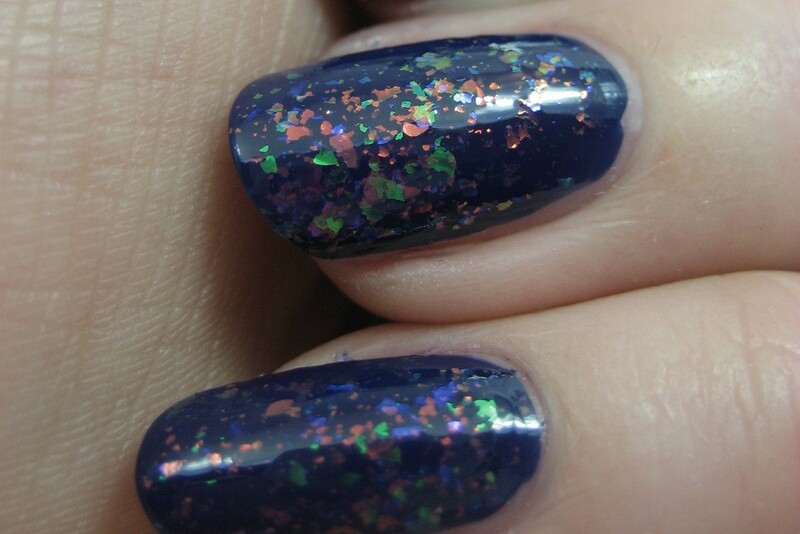 Purple Confetti is on the list because despite the vast quantities of glitter in my stash, the only other polish I have that's remotely similar to this one is its sibling from the same collection, Mediterraneo Sea. 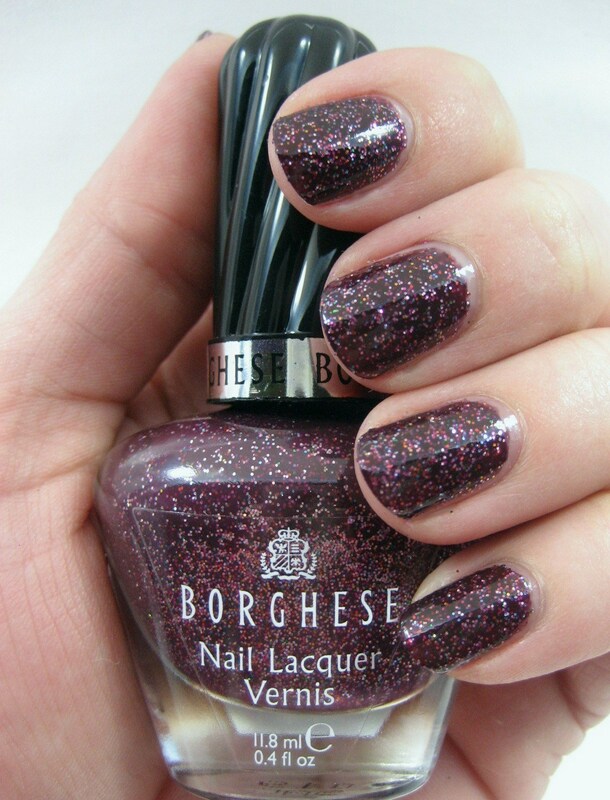 I don't know how Borghese managed to have the glitter not get covered up by the deep opaque base color, but I'm glad they did. 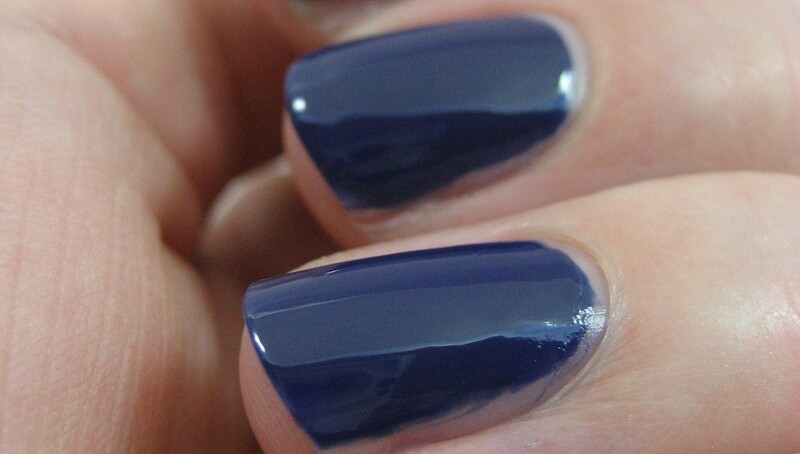 Without top coat, it dries matte, which I find very interesting. 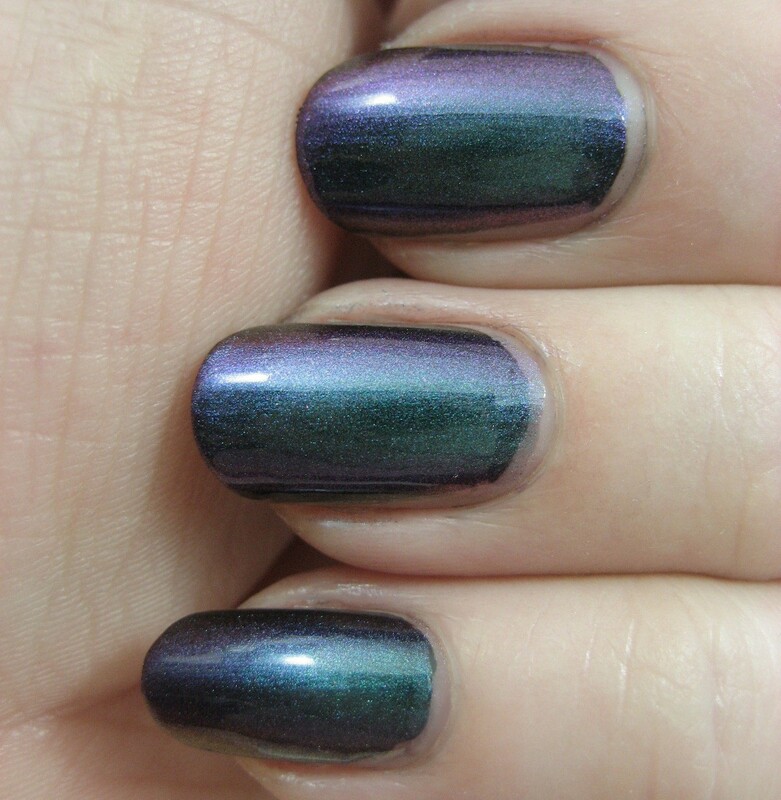 With topcoat, it still holds my gaze. 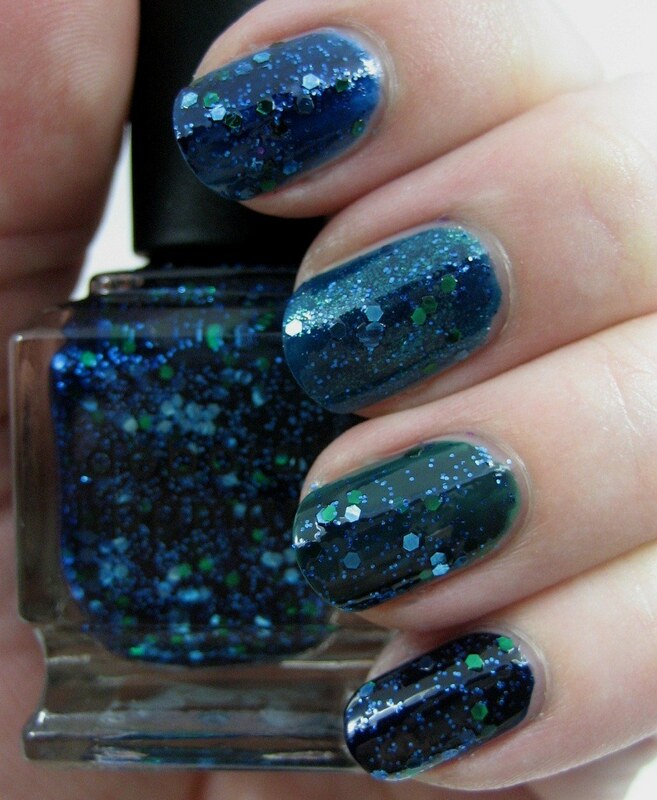 Mad as a Hatter is just a wonderful jumble of colors that I love looking at it whenever I'm wearing it. Unlike the first two glitters, Across the Universe has a very controlled color palette, just blue and green, but the balance of hues and values in it means it's not boring. 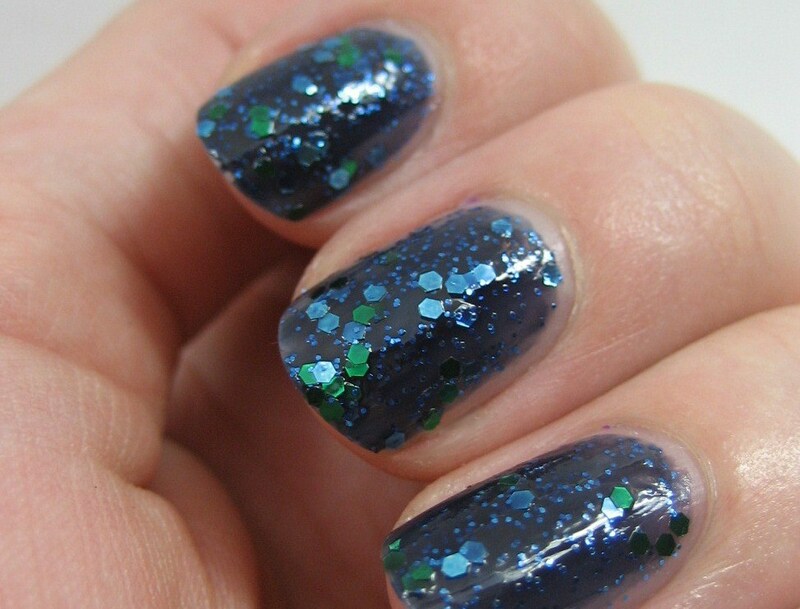 I love layering Across the Universe over blues and greens; here it is on (top to bottom) China Glaze Towel Boy Toy, Zoya Charla, OPI Jade is the New Black, and Sally Hansen Salon Navy Baby. 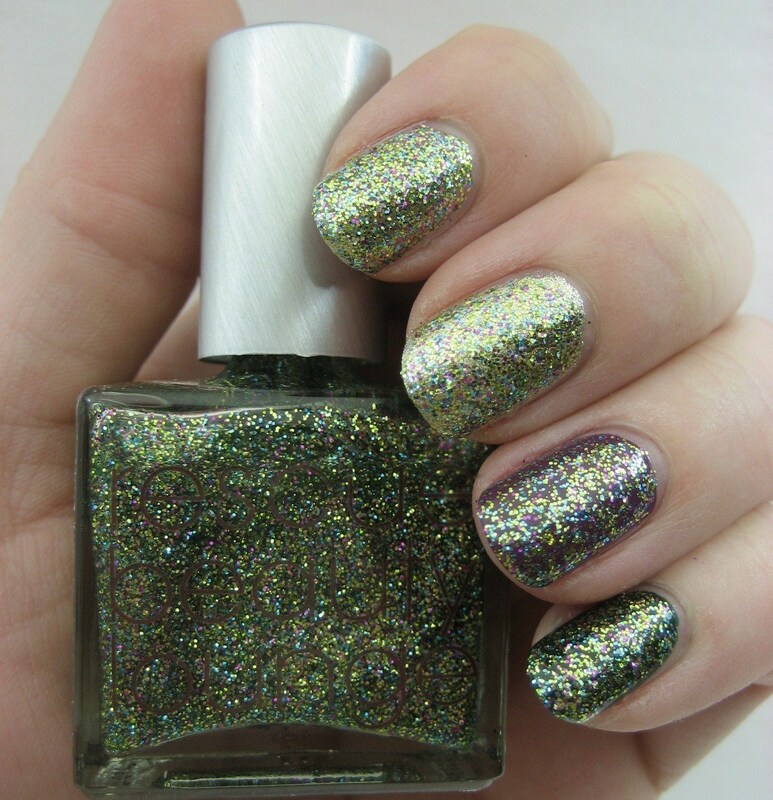 Butter London No More Waity Katie made the list because it combines three of my favorite things: glitter, purple, and purple-taupe. I know some people had problems with the formula of this one, but I found it pretty well behaved. 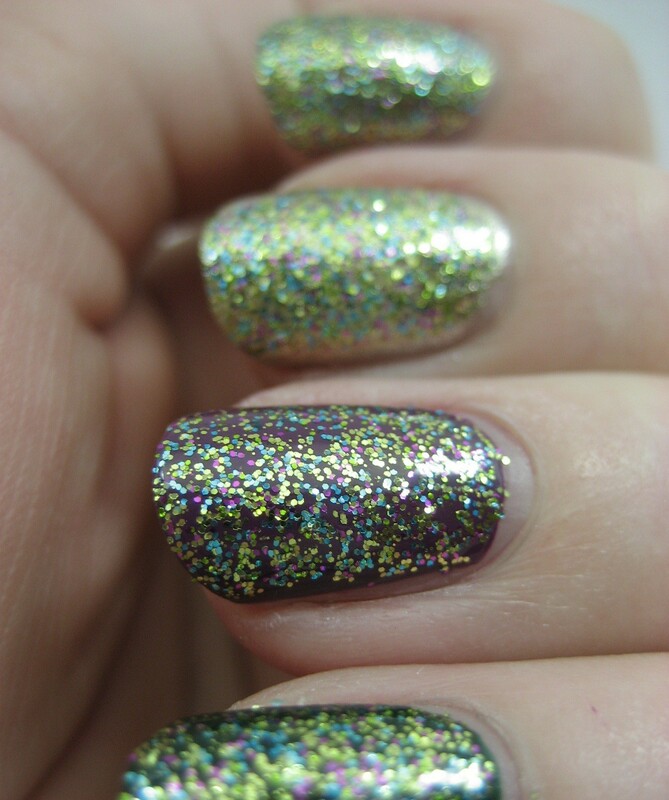 On its own, it builds to a nice depth, with the glitter floating at different levels in the taupe base. 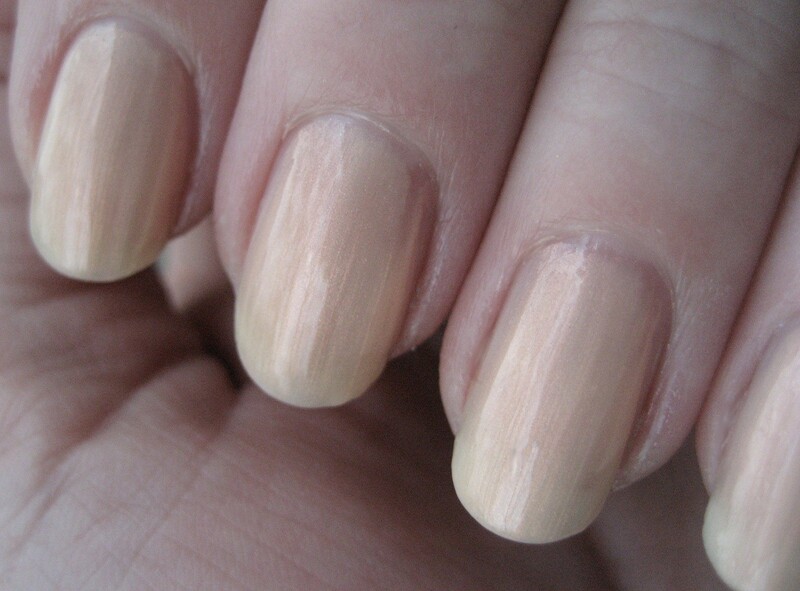 One coat over a taupe base (here it's Nina Ultra Pro Never Glum Plum) gives a similar look with fewer coats required. And finally, Locavore. Of course this had to be on here. I wanted it so much for so long, and when it got here it did not disappoint. It looks good alone; it looks good layered. 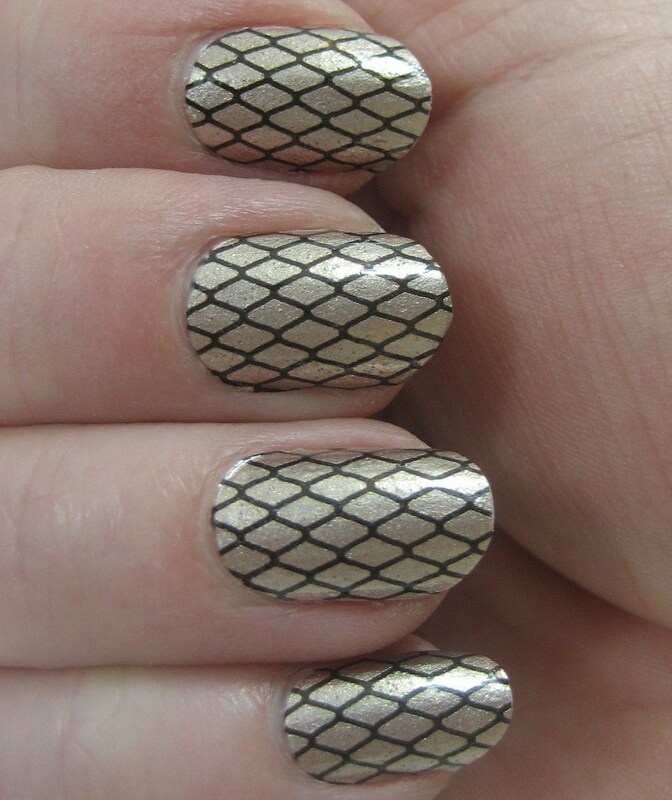 Given that I tend to prefer silver over gold, I'm a tiny bit surprised I love this as much as I do. 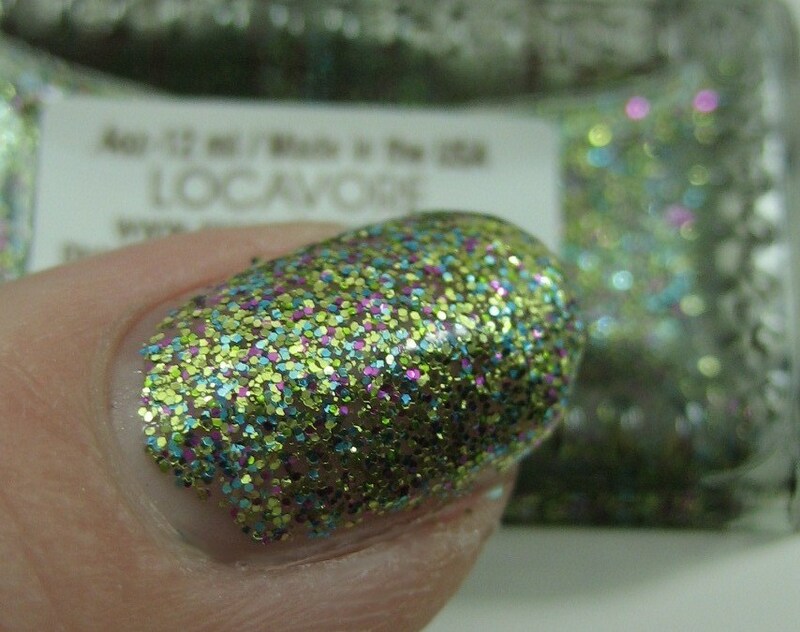 Top to bottom in the photos above and below, that's Locavore by itself, then over Revlon Gold Coin, over Sally Hansen Complete Salon Manicure Anemone of Mine, and over Sinful Last Chance. 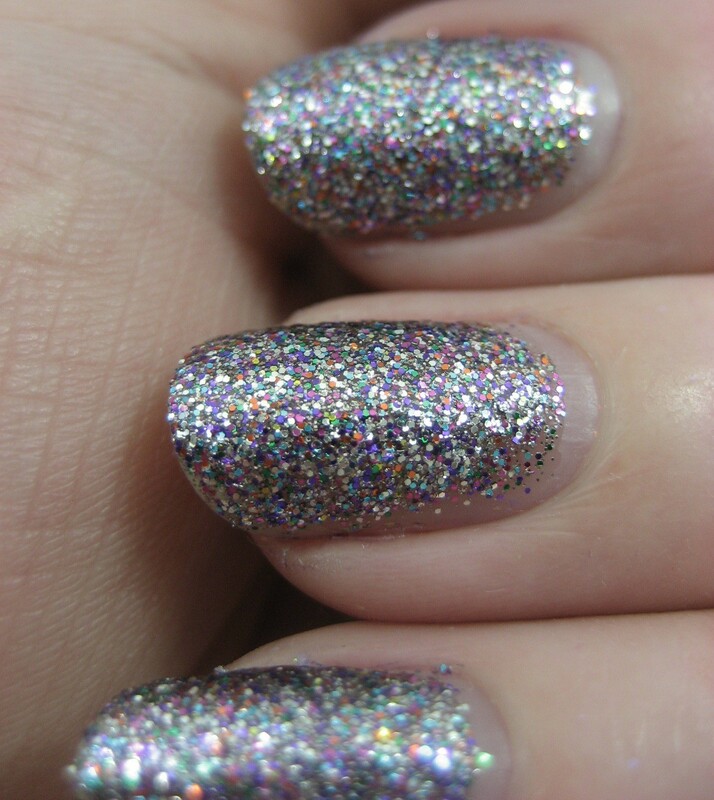 There are so many other glitters I would have liked to put on this list. 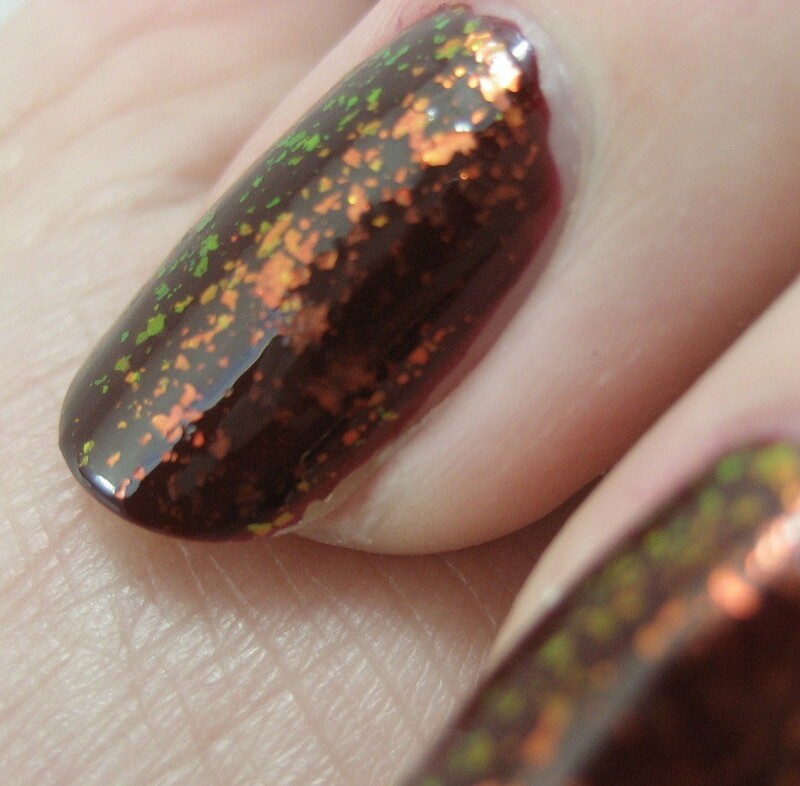 Maybe someday I'll do a Top 20 Glitters list. Or Top 50. 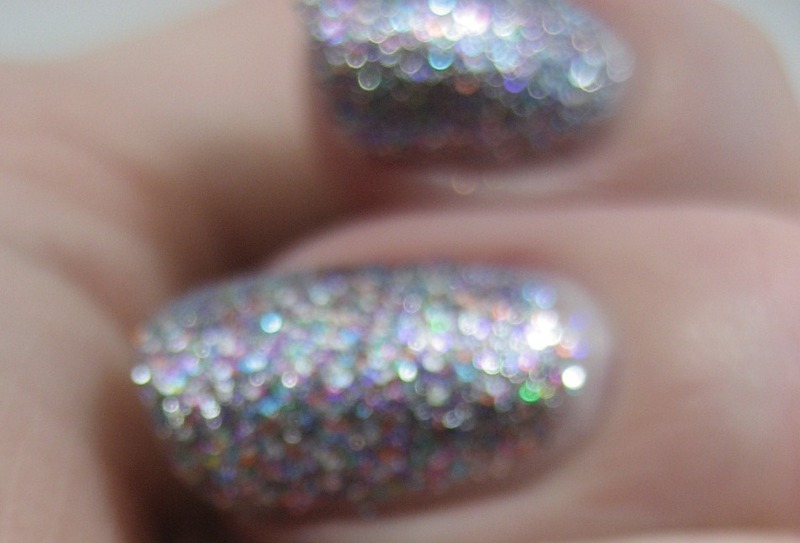 China Glaze did a collection of 50 glitters, why not me? Tomorrow my Top 20 of 2011 series concludes with the Special Effects Division. Today it's the Creme Division. 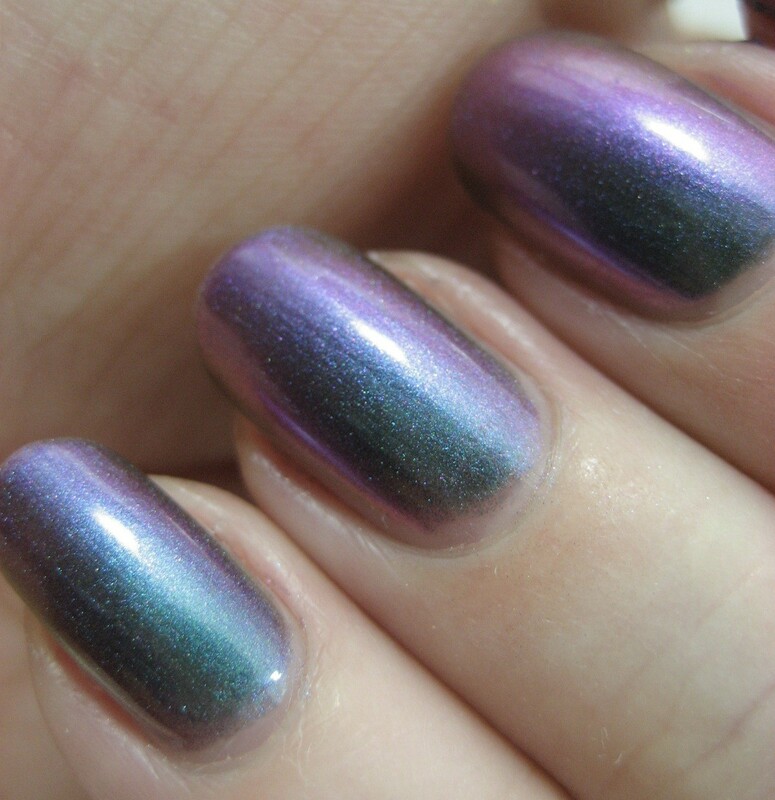 Let's start with the two from last year's list that I brought along to this year's: Orly La Playa and China Glaze Channelesque. La Playa is still my favorite blue creme. It's flattering on my skintone and stays blue in almost all lighting conditions. 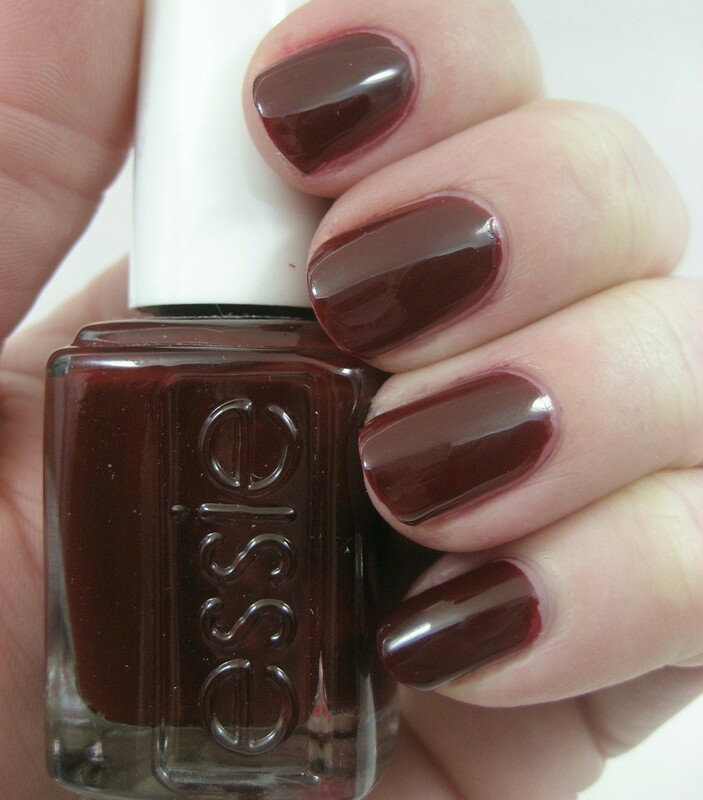 Essie Berry Hard is a newcomer to the list this year. It's got the same qualities as La Playa, just in red. I like this one so much I bought it three bottles of it (which I realize is excessive, and I have swapped away one of them). 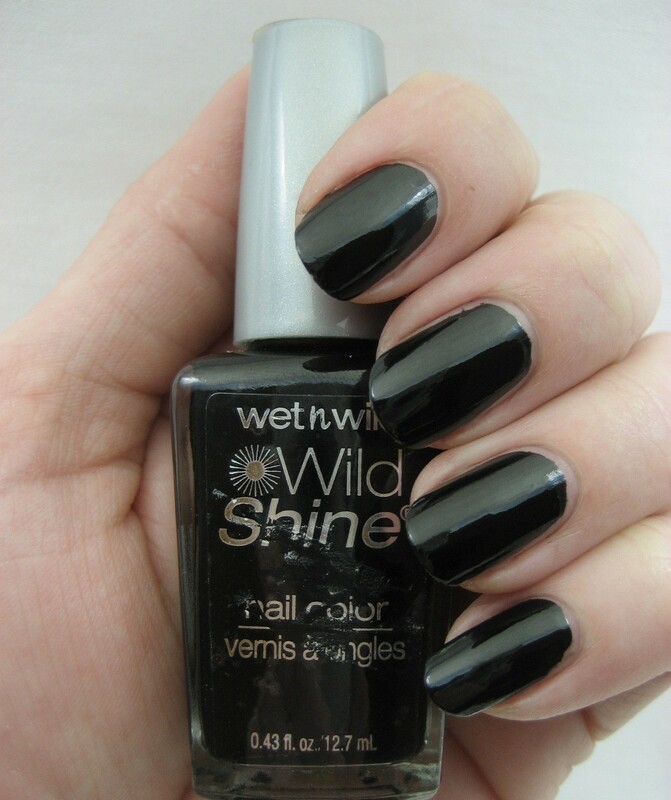 I use Wet 'n' Wild Black Creme from the Wild Shine line so much that I decided it deserved a place in my Top 20. I think it's the best value in my whole stash: 99 cents for .43 fl. oz. 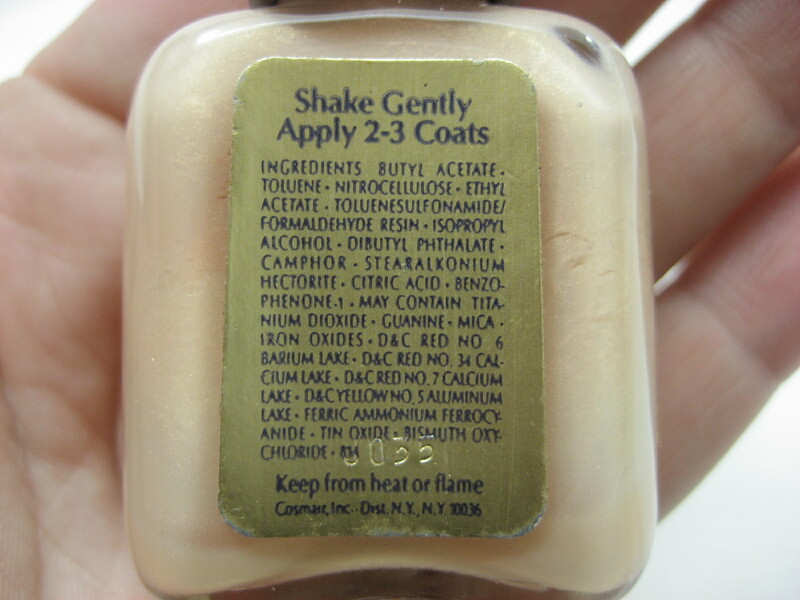 but often on sale for 25% or even 50% off, and it covers in one coat. It's my go to black underwear for layering (I used it with Turquoise Opal for yesterday's entry) and my go to black for stamping. 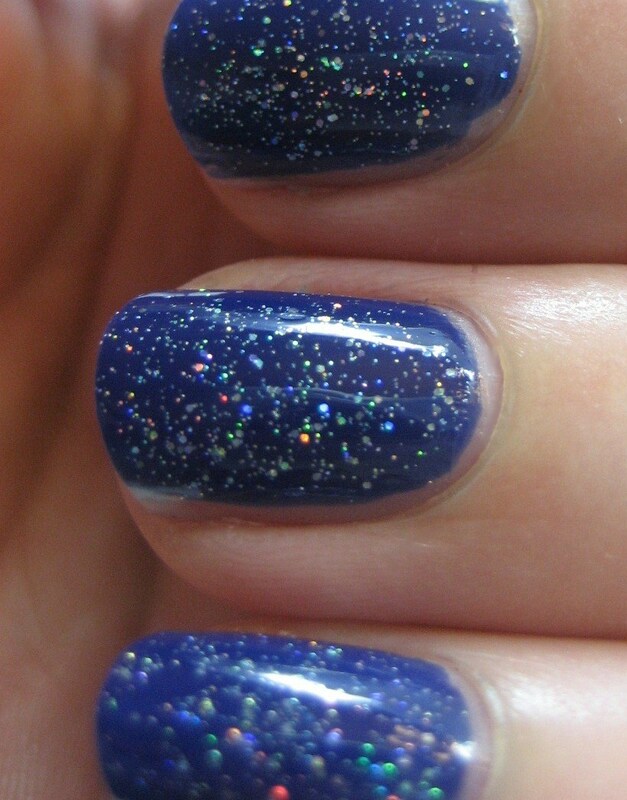 Here it is by itself, one coat, no topcoat. 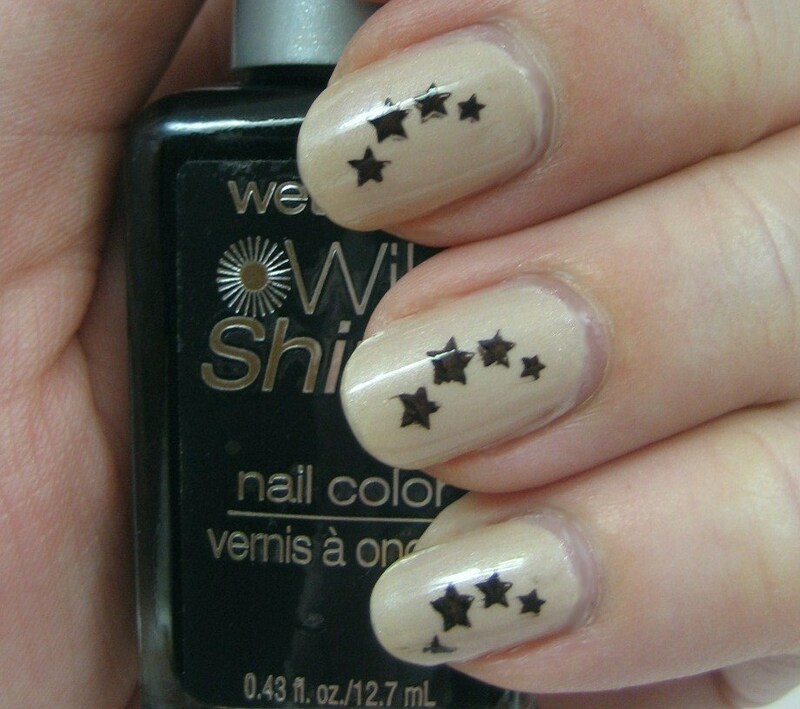 I think every nail polish collection needs some cremes in it, and these are my favorites. 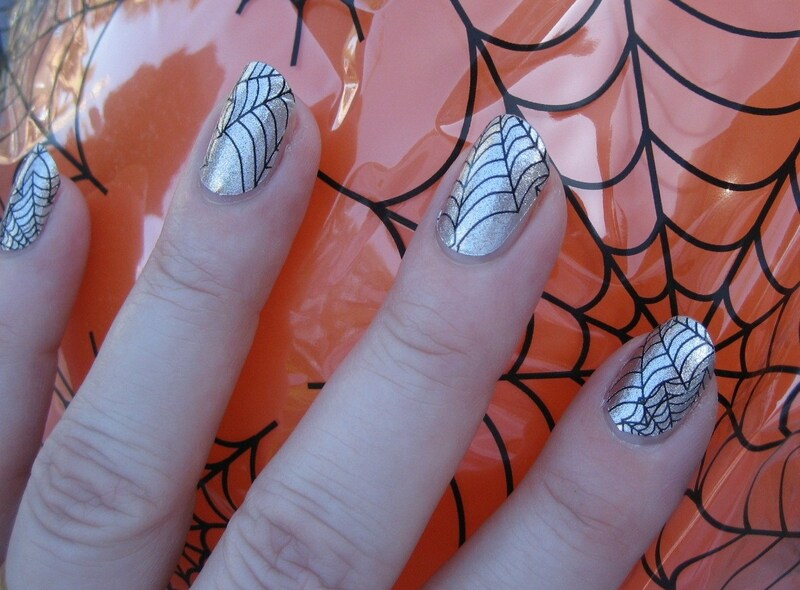 My first runner-up in this category is Sally Hansen Insta Dri Whirlwind White. If I was doing a Top 30, that would probably have made the cut. 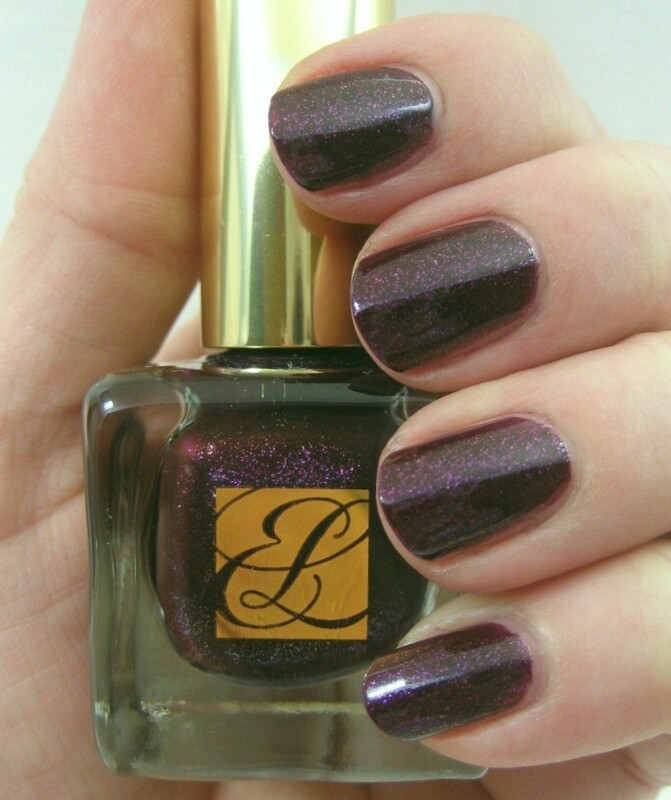 Coming up in Part 3: Shimmers. I didn't get my act together in time to submit a Top 20 for the boards this year but decided I'd do it on my own anyway. 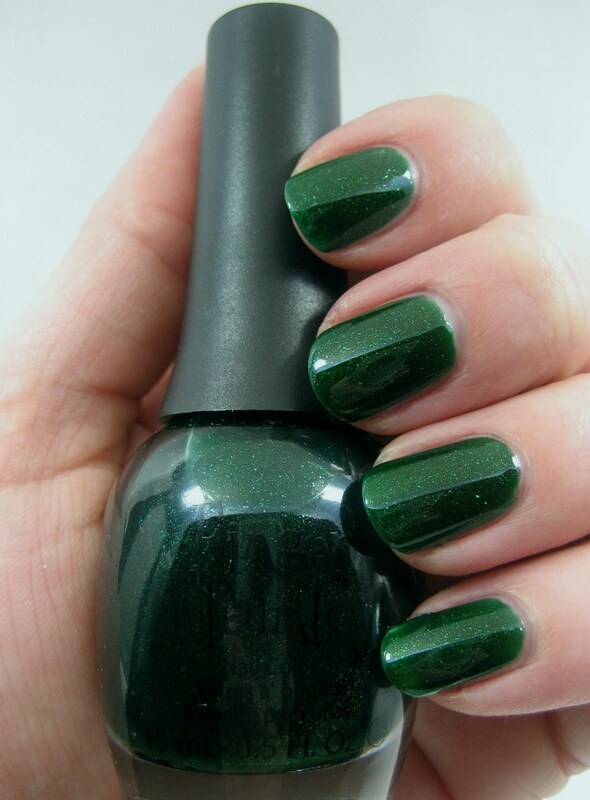 To come up with my list, I looked at what I chose last year and what I've worn since then and also thought about which bottles of polish I'd be most likely to keep if ever decide to do a radical de-stash (I wouldn't say such a thing is likely at this point, however). 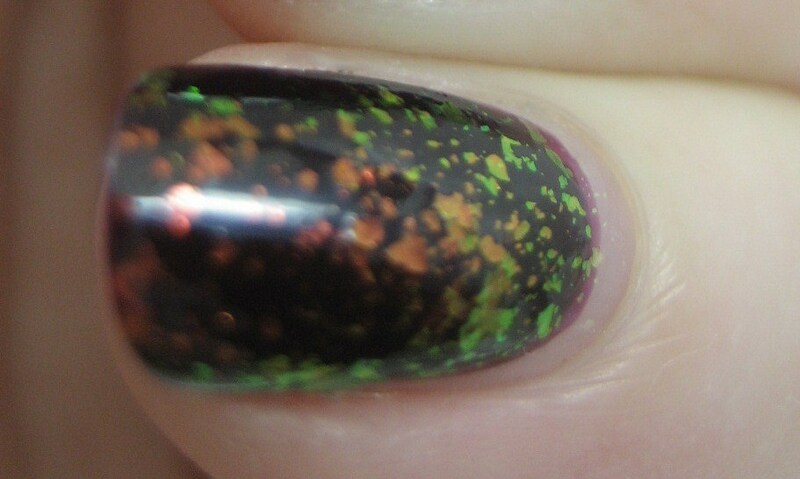 Of course my first cut at the list had rather more than twenty polishes on it, so I had to make some tough choices. Instead of posting my whole list in one entry, I decided to group them into categories and post one category each day this week. Today, it's the Nostalgia Division, which are polishes that survived all my stash purges of the 80s and 90s and 00s. 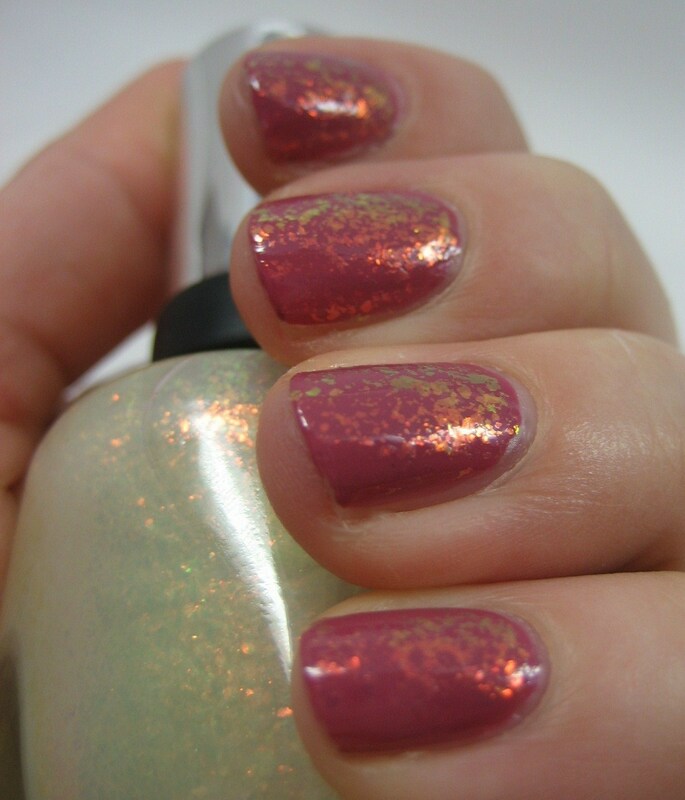 The photo above shows one coat of Rose Délicat. 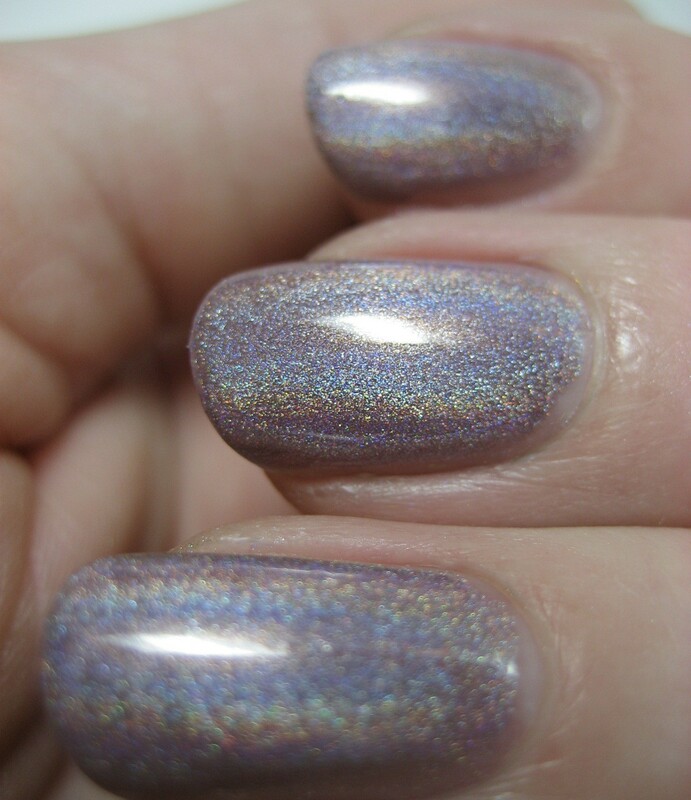 When I grabbed it to swatch for this entry, I used two coats, but it's probably more the effect three would have been when it was new, since it's thickened up noticeably. I didn't put any thinner in, but I'm going to have to if I want to use it again. 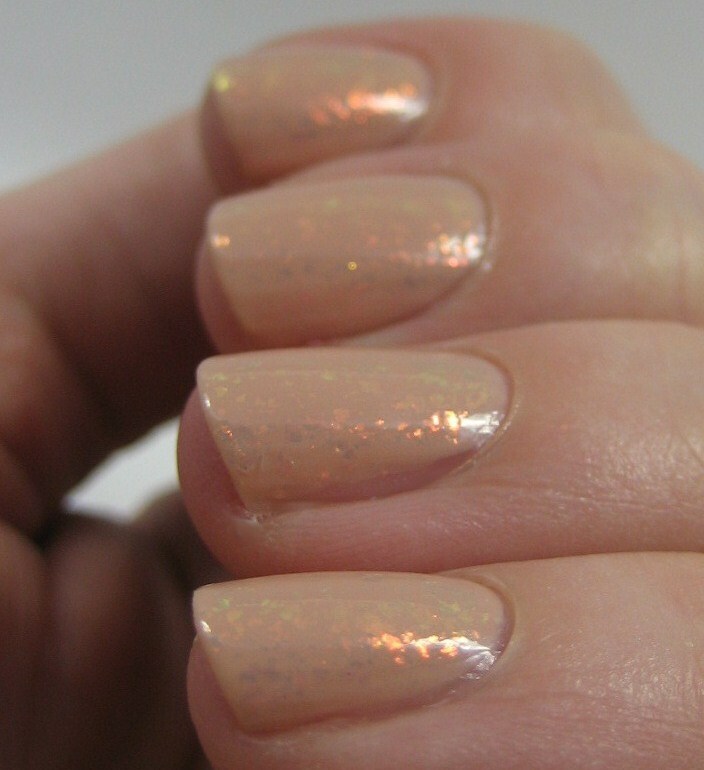 For the swatch below, I added some OPI topcoat to level out the goopiness from it being so thick. I admit this one is on the list purely for sentimental reasons. 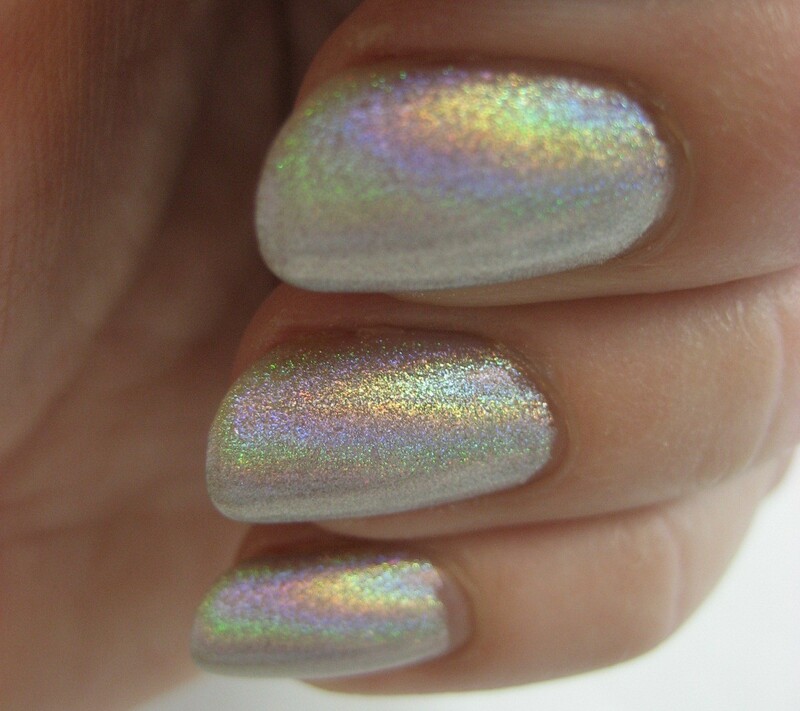 I have a lot more interesting polishes in my collection now and even in the pale peachy shimmer category I have prettier ones, but this one is special to me. 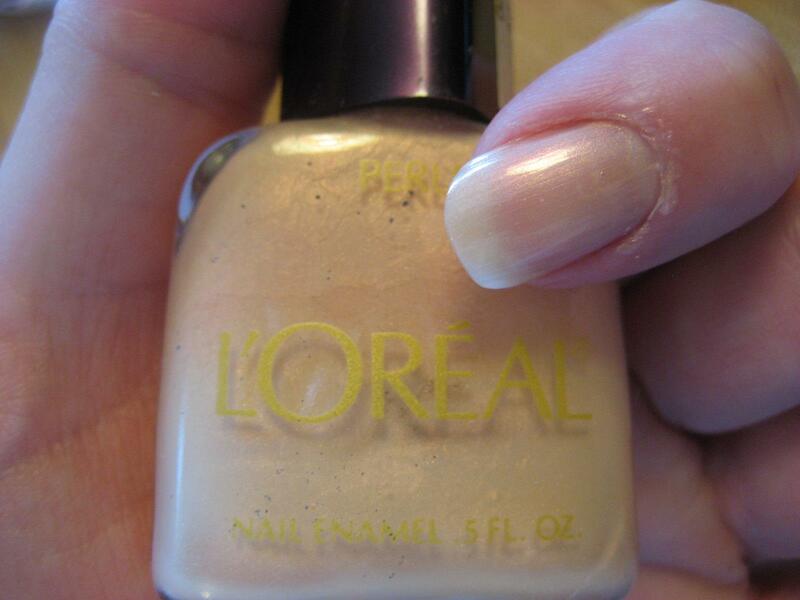 Look how low the level in the bottle is—that's how much I wore it back in the day. And look at these ingredients—no Big 3 Free here. 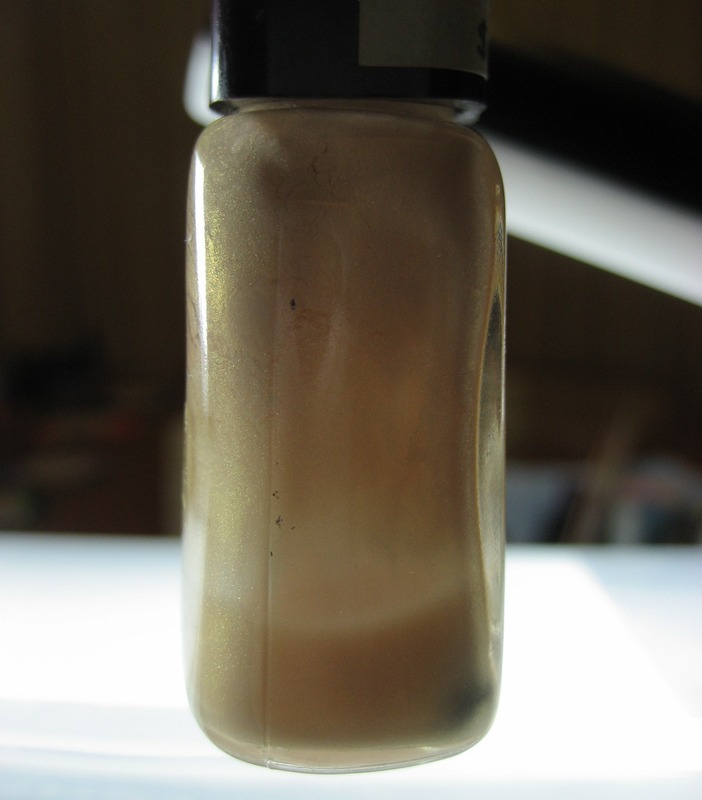 Dibutyl phthalate? Yep, we got that, and toluene, too. You can't see it in this photo, but the original price tag is still on the cap; I paid $2.98 at Osco (which at the time was a separate drugstore; now they're all rolled into Jewel-Osco grocery stores if my visits back to Illinois are any indication). 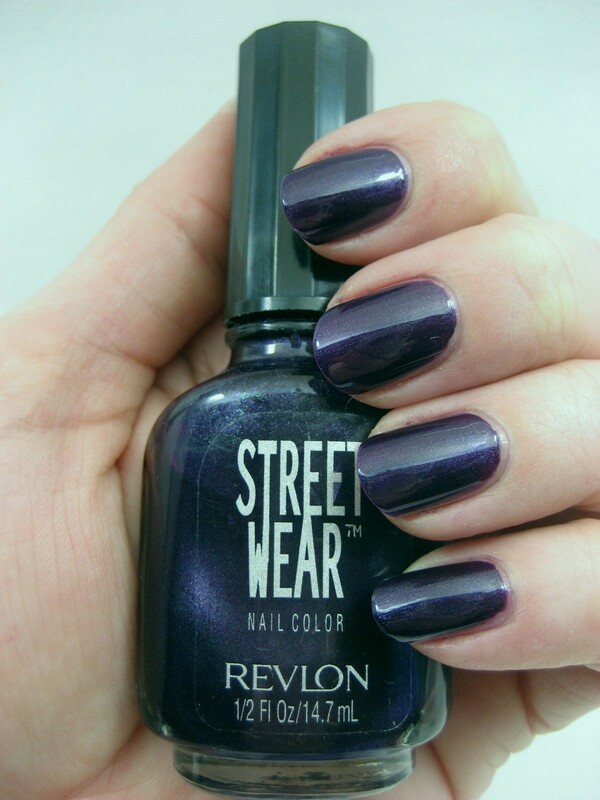 The other polishes in this division are all carryovers from last year's list, starting with Revlon Street Wear in Grape. I remember when the Street Wear line first came out; the colors were so different than most of what was in the stores then and so different than what I was wearing. They looked edgy and a little strange to me, but I did buy some. 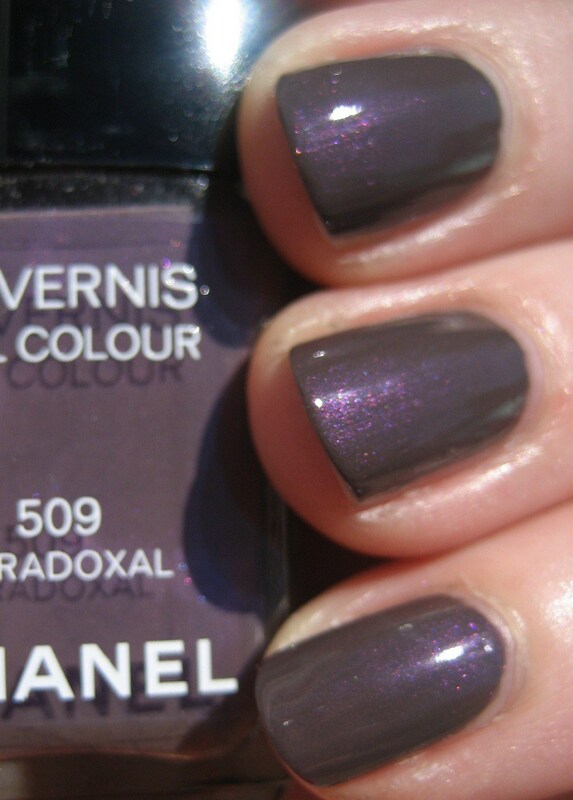 The only one that's still in my stash from those original purchases is Grape, saved by my love of all things purple. I've since swapped for a lot of other Street Wears, but Grape has a special place because it's been with me the longest. 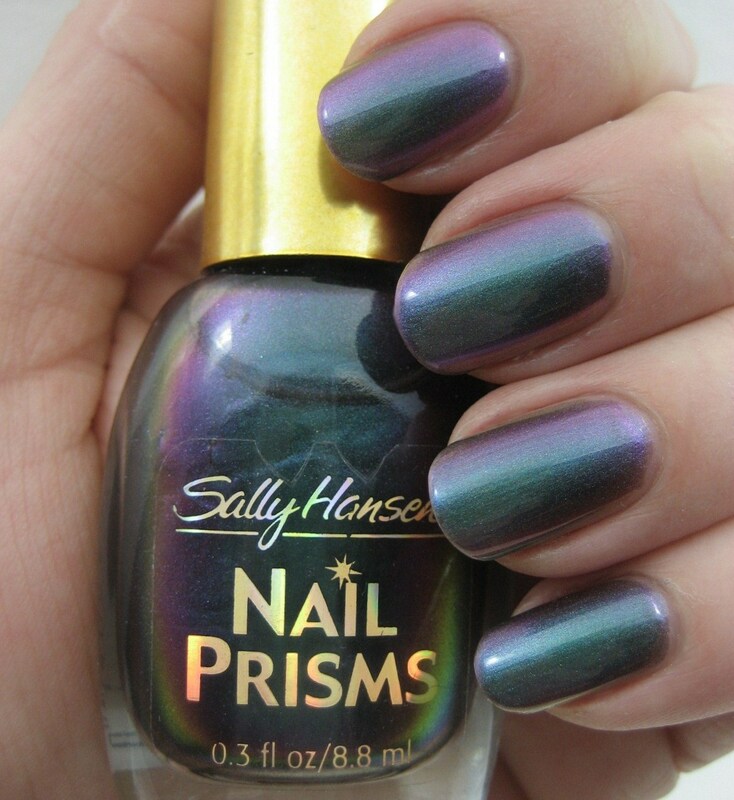 Sally Hansen Nail Prisms in Purple Diamond was one of the first holos I owned. 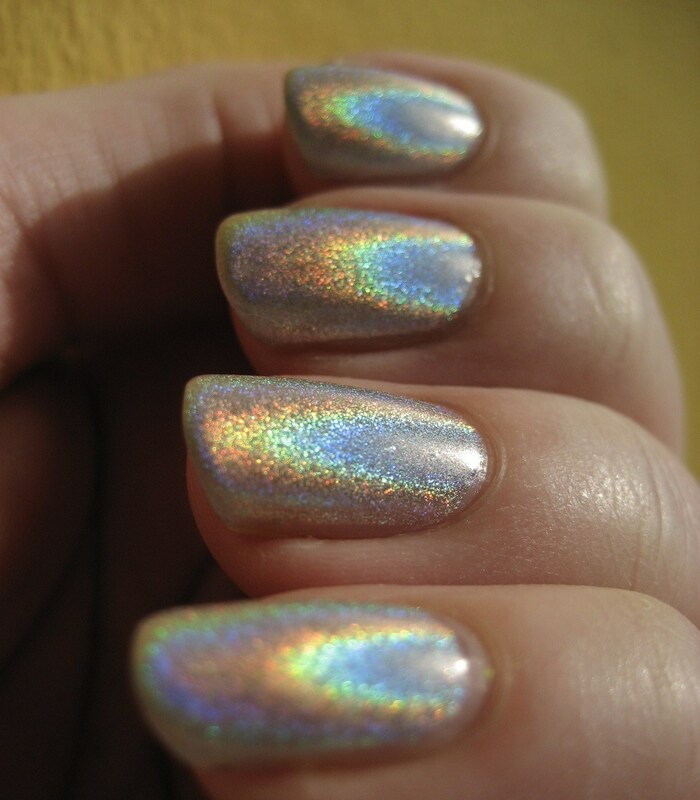 I'm not sure I even knew the word holographic at that point; I just knew it was pretty. In indirect light, its rainbows are shy. 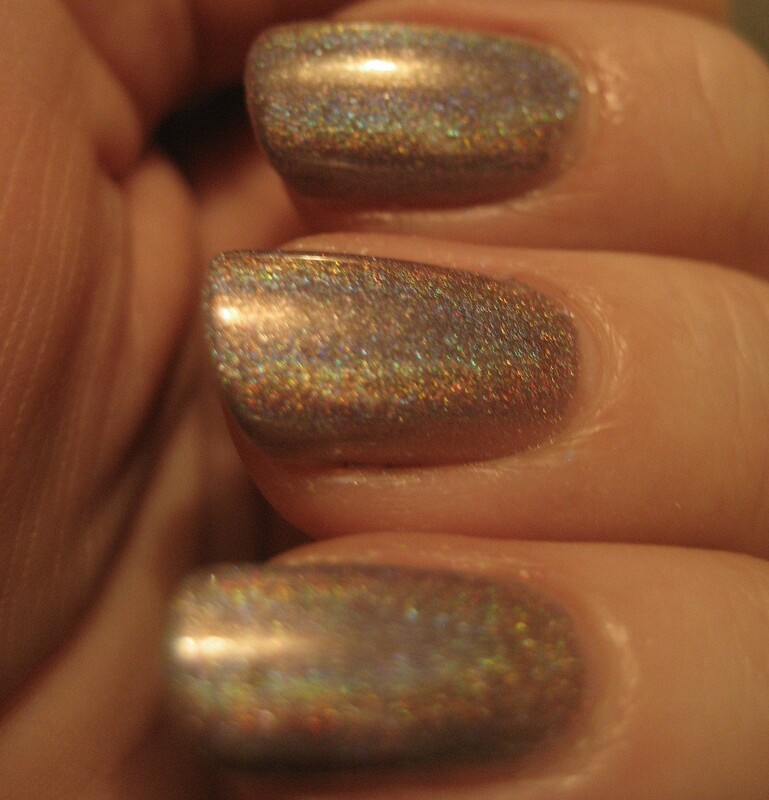 In direct light indoors, the holo starts to show, even in low light situations. 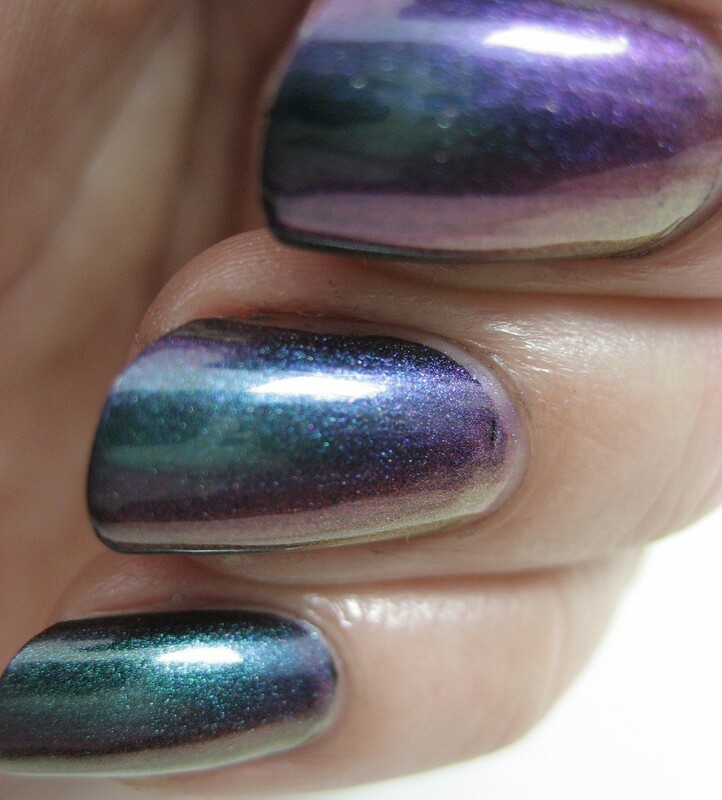 There was no sun when I was swatching this, but this flash shot should give you an idea of how it looks in full rainbow mode. 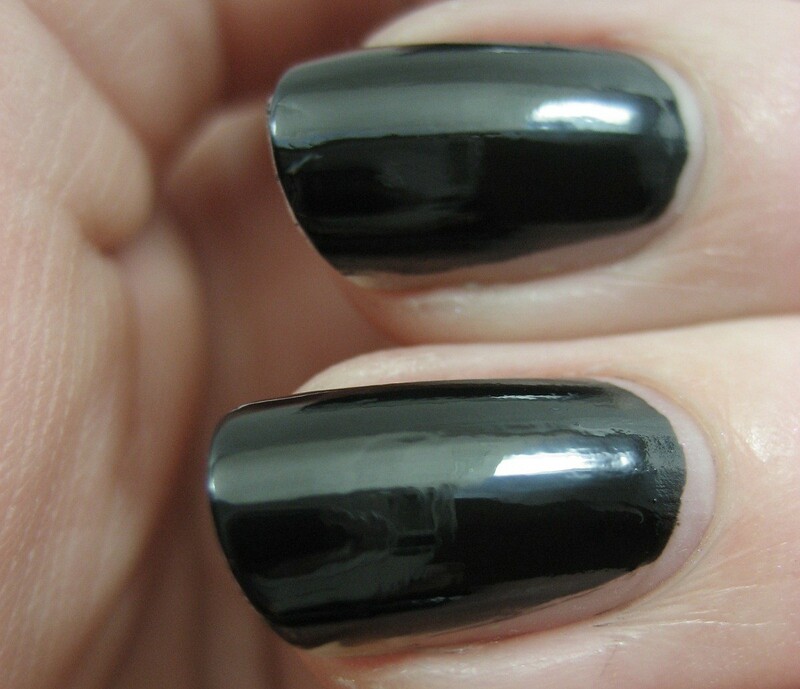 This is two coats, which is a tiny bit on the sheer side; three would give more depth. 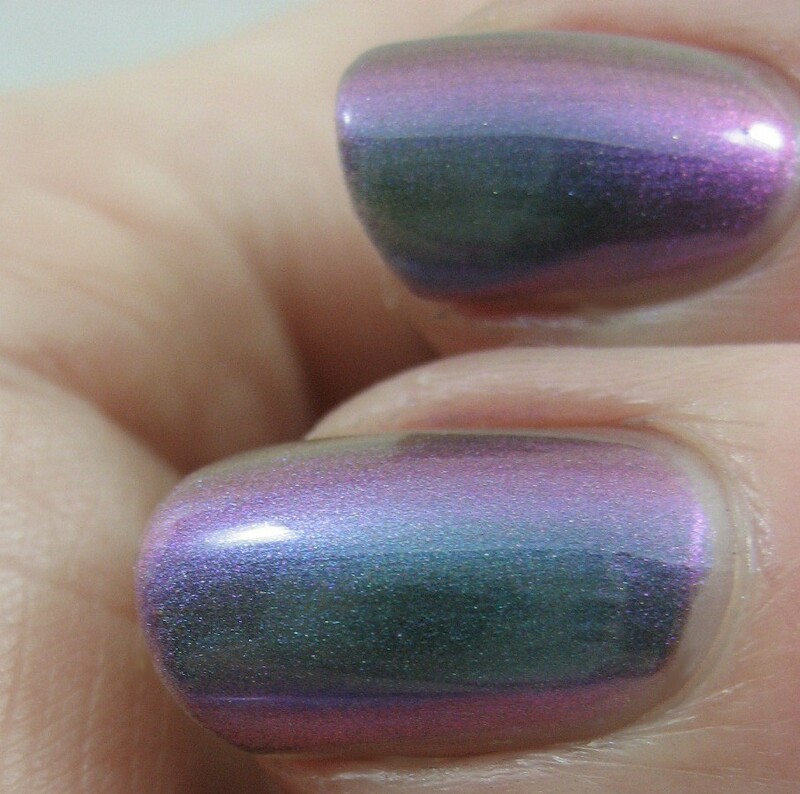 Sally Hansen Nail Prisms in Turquoise Opal was another revelation to me—my first duochrome polish (again, before I knew the word to describe it). Is is purple? Is it teal? Is it both? It all depends on the light. Sometimes pink and even gold show up, too, though I didn't manage to capture them on camera this time. 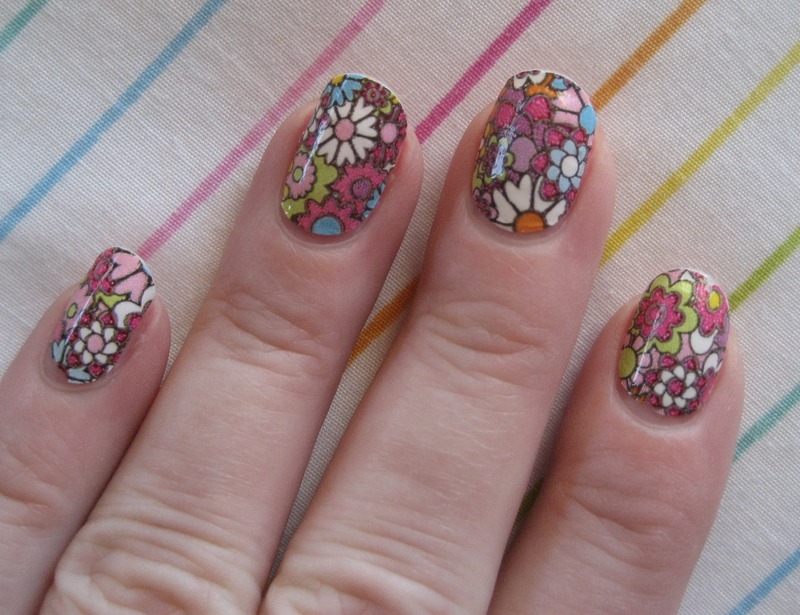 I'm glad I held on to these four polishes. I'm sorry I didn't keep more from that era but thanks to swapping and blog sales and Dollar Tree I've been able to replace most of what I regretted destashing, plus picked up some things I never bought in the first place. 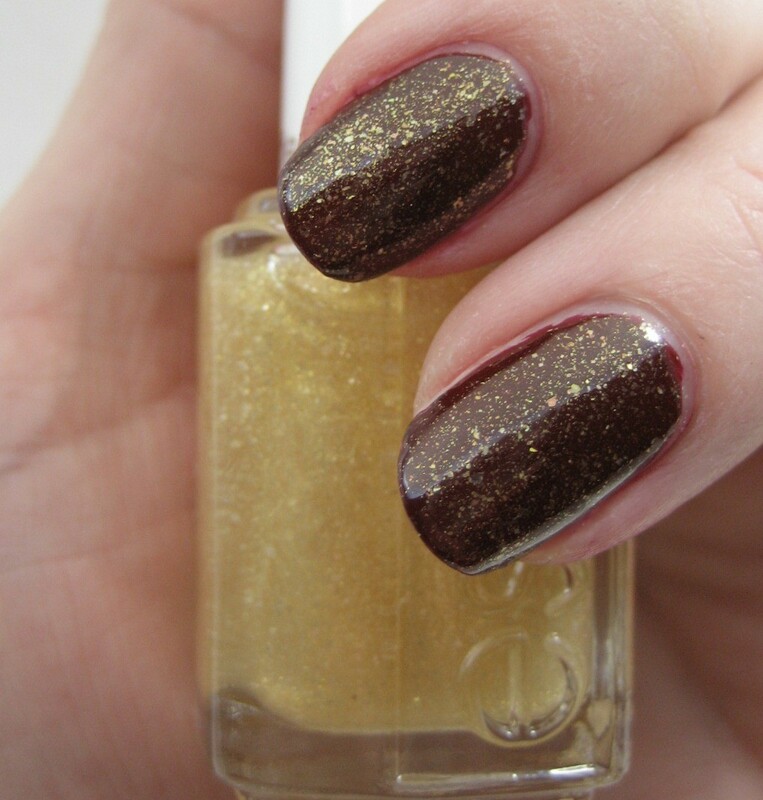 Coming up in part 2 tomorrow: Cremes.